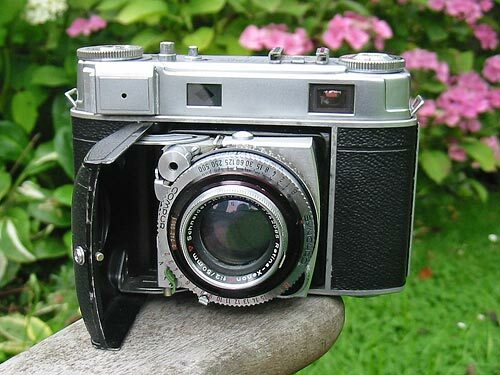 Manufactured from 1954 to 1957, this folding 35mm rangefinder camera was fitted with an interchangeable lens, either a Schneider Retina-Xenon or Rodenstock Heligon, both were 50mm f/2.0 lenses. Eastman Kodak apparently only imported Schneider-equipped cameras into the USA, so cameras with Rodenstock lenses are uncommon there. 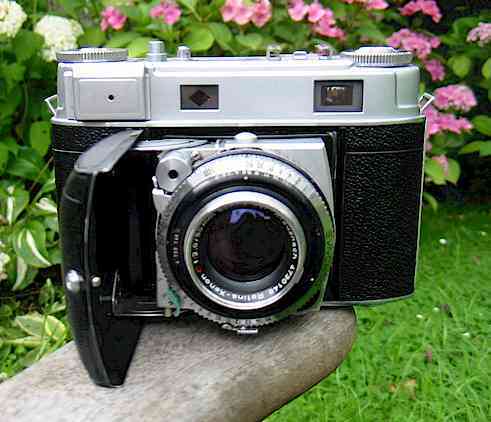 The one pictured here is an early production model with polished alloy body edges, no guard around the film release lever,and has the aperture setting scale below the shutter. This one is a later production model, showing chrome trim edges at the top and bottom of the body casting. A guard is present around the film release button, the aperture scale is now visible at the top of the shutter, and the clip that holds the aperture setting to the shutter speed dial is the later, more effective type. The Retina IIIc with the standard lens fitted is a pleasant camera to use, although some may find using the bottom-mounted film advance lever a little awkward. The uncoupled two-range exposure meter delivers the information in the form of 'exposure values', you then set this number on the shutter/aperture scale and can then choose which particular equivalent shutter speed & aperture combination will best suit your needs. The lens system is a convertible type where the front group only is interchangeable. The alternative focal length lenses were a 35mm f/5.6, a 35mm f/4, or an 80mm f/4. The wide-angle and tele accessory lenses are not convenient to use. An accessory viewfinder is required to cover the field-of-view of the lenses. You will also need to focus using the rangefinder, read off the distance on the main focus scale, and then transfer this reading to the wide-angle or tele focus scale at the bottom of the shutter housing as appropriate. It is probably worth noting here that it is impossible to close the camera front with the accessory lenses in position, even the tiny 35mm f/5.6 wide-angle. Retina IIIc instruction manual on Mike Butkus' excellent website.